Successful cattle operations are built on relationships. That fact isn't lost with David Horton, owner of Friendship Farms in Midville, Georgia. It's an especially important fact, considering Horton hasn't always been in the purebred business. From a teenager, he raised a herd of 350 commercial cattle - a venture that began when he persuaded his neighbor to use an Angus bull on his Holstein cows. With the help of his mother, Polly Stewart, he was able to raise 150 calves a year on the bottle. Horton partnered with Ronnie Turner. "[Ronnie Turner and I] were best friends and felt naming the farm Friendship Farms was fitting," Horton says. He later sold that herd to a woman who gave him an offer he couldn't refuse. 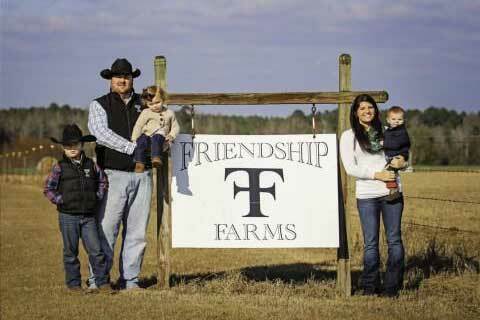 That sale opened a door; and with the help of many, Friendship Farms became a reality. "I sold out to her and took this opportunity to follow my dreams of having a purebred herd of registered Angus cattle," Horton says. The purebred herd started in 2009 and is now more than 400 head. But Friendship, as the name suggests, is still a team effort: Horton relies on two cooperators, a bull developer, a sale manager, genetics from many well-known herds and a family-like farm crew to get the job done and continue to bring the operation into prominence. Both Jimmy Blitch in Statesboro, Georgia, and Don Liskey out of Virginia run about 200 embryo transfer calves out of their 25 donor cows annually. If the recip cows on the Midville farm don't take the embryo, they're bred to an Angus bull and sold as commercial cattle, Horton says. "We have a fall and a spring calving season," he says. "We are calving about six months out of the year." 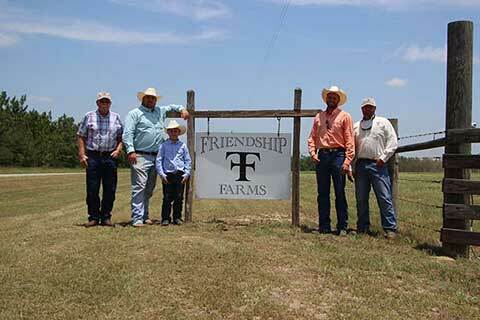 This year, Friendship Farms registered more calves than it ever has. Horton says they have doubled in size almost every year they've been in the purebred business. That's due in part to the relationship Horton's cattle have with breed-leading genetics. The herd's foundation can be traced back to Wehrmann Angus. The demand for such top genetics led to annual production sales, which continue to grow each year. Horton saw an increase in demand for bulls, most of which are now sold private treaty, but a bull sale could be next up for Friendship Farms. He's looking at building his own bull development facility because the growth of that side is tremendous. Right now, Horton sends bulls to Evans Hooks to be developed on ryegrass silage; and in the past two years, two have been selected by AI stud companies. "It's pretty awesome to have your animals recognized by companies like ABS and Accelerated Genetics," Horton says. "It was very exciting to have two bulls go to stud in two consecutive years." Since the production sale started, Friendship Farms' cattle made it to 26 different states. Horton credits his friend Parker Friedrich with advice on cattle trading and sale management with the continued growth of each year's sale. Friedrich has become part of the family at Friendship Farms. The quality is what draws buyers in; but like everything else at Friendship Farms, it's the pride of building a business on strong relationships that keeps them coming back each year. That's a characteristic that, like his cattle genetics, comes in part from Wehrmann. Horton credits Richard McClung, a former partner in the famous farm, for teaching him about the Angus breed, selection advice, and how to treat customers. Horton has always looked to McClung for wisdom and advice starting as a kid and still does today. The relationships are strong at home, too. Hunter Barrett, the manager at Friendship Farms, is in charge of day-to-day happenings on the five different locations that make up Friendship Farms. He grew up on his family's 130,000-head feedyard in Hereford, Texas, and enjoys being part of the Friendship crew. "It's been interesting to learn how this side of the cattle business works," Barrett says. "Growing up, I saw the end of the road and now I get to see the beginning. I love it. This is what I love to do." Horton says he's proud of how far Barrett's come since joining the team. "He is a quick learner," he says. "I am looking forward to this breeding season and hearing Hunter's thoughts on breeding decisions. He will definitely have an input." Barrett's fellow crew members are Chris Sherrod, the "go-to" guy for whatever needs doing on the farm, and Roger Johnson, affectionately known as Uncle Roger. Johnson is the longest-standing member of Friendship Farms' team. "Roger has been working on this farm for three of the five generations that it has been in the family, even before it was Friendship Farms," Horton says. "His experiences over the years have taught him a lot. He knows about row cropping, baling hay and managing cattle. He and my mother are who taught me what hard work was." Though the farm was named for a partnership with his best friend, Horton could easily have named it Family Farms - because his partners are like family, and his family is an equal partner in the farm's success. His wife, Carmen, takes care of the paperwork for the farm in addition to helping parent their three children at their home in Savannah. Their three children are: Bryson, 10; Bentley, 5; and Braxton, 4. "The farm is a great place to get my family away from the hustle and bustle of Savannah," Horton says. "Working on the farm is a great place for them to learn work ethic, just like I did growing up." And since he also owns a mill work company in the city, it's no surprise that Horton again gives the credit for a successful farm back to those he's built friendships with for years. "Having a great crew makes it easy for me to be away in Savannah," he says. "I try to split my time between the farm and Savannah. I know it's in good hands when I am away."